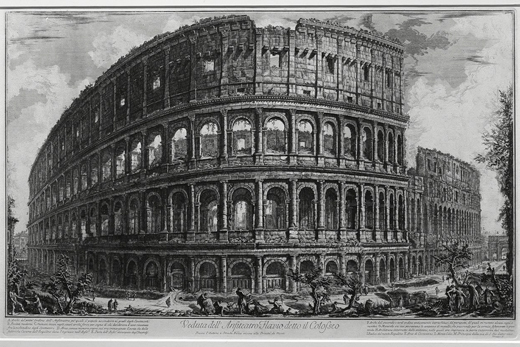 An etching from 1761 of the Colosseum in Rome. Courtesy of Bruce M. White. An exhibition that virtually transports visitors to historic Rome opens at the Michael C. Carlos Museum on Aug. 24 and runs through Nov. 17. "Antichità, Teatro, Magnificenza: Renaissance and Baroque Images of Rome" is a display of the maps, views and books of Rome from the 16th-18th centuries. "Antichita" is the 1561 reconstruction of the ancient city and features a 16th century map that is part of the Carlos' collection as well as rare book collections from the Emory Libraries. "Teatro" highlights images from a 1667 map of Rome. These works record changes in the city by the 17th century popes when piazzas were broadened and opened up to become stages where the life of the city took place and where the Catholic Church could show its muscle. "Magnificenza" takes an archaeological view of the city and its ancient monuments. Visitors to Rome on the Grand Tour in the 18th century purchased the prints as souvenirs of their journeys and what they had learned. The exhibition uses gaming technology to offer visitors the opportunity to experience a 17th century view of "Virtual Rome." The virtual experience is based on the bird's-eye view map of artist Giovanni Battista Falda, published in 1676, and includes the fine detail of more than 300 etched views of the city by Falda. The technology uses a highly detailed visual of the composite image to let viewers feel they are walking the streets of Rome and even be able to count windows in the building façades and distinguish between the types of trees as they "walk" around. Visitors "will be able to wander the city in detailed maps and marvel at imposing architecture in the diverse images of Rome," says co-curator Margaret Shufeldt. The objects in the exhibition are part of the Carlos' permanent collection, rare books from the Emory Libraries and on loan from collectors. In conjunction with the exhibition, the museum will feature a series of lectures and programs, including gelato-making and a cheese-tasting. Visit carlos.emory.edu to see the full schedule of related educational events. "Romare Bearden: A Black Odyssey" is the subject of another special exhibition opening Dec. 14 at the Carlos. In 1977, 20th century modernist artist Bearden created a series of vibrant collages and watercolors based on Homer's epic poem. The works create an artistic bridge between African American culture and classical mythology. The series was only shown briefly that year and this is the first time the Smithsonian Travel Exhibition Service has launched a full-scale presentation of these works outside of New York City in over 35 years. The Carlos Museum is one of a select group of institutions to host the exhibition. Also on display will be a rare grouping of mid-1940s Bearden drawings based on the other Homer epic, the Iliad.